A new recording of Machaut’s Mass is always an event, and this one is compelling and provocative in equal measure: compelling, because of the beauty of the voices and the evident care that has been lavished on so many details; provocative, because so many of those details will surprise, startle and perhaps infuriate. Inevitably, these details include the choices of interpretative accidentals (musica ficta, to use the convenient shorthand), since very few recordings agree on these. Then there’s the choice of sonority, very much the house style of Björn Schmelzer’s ensemble, and modelled on Ensemble Organum. It’s sometimes informally referred to as ‘Corsican goatherds’, and although it has its detractors, it has seldom if ever been deployed in polyphony as convincingly as here. Along with a distinctively nasal vocal production, this involves a luxuriant, microtonal approach to ornamentation, most often associated with non-Western chant and folk traditions. To all this Graindelavoix add a deliberately flexible approach to rhythm, which successfully distinguishes between the two main compositional styles deployed by Machaut. It’s very skilfully done: the rapid exchanges between voices (known as hocket) sound very fluid and yet perfectly controlled. Even the doubling of voices at the octave (a staple of Paul Van Nevel’s work with the Huelgas Ensemble) suggests the timbral mixture of organ registers rather than the gratuitous distortion of the music’s syntax. All this comes together in the held chords that punctuate the Gloria and Credo: Graindelavoix make them come to life from within, and I doubt whether anyone who hears them like this will think of them in quite the same way again. To be clear: little of this is new, and Schmelzer’s suggestions to the contrary account for at least some of his critics’ resistance; that, and his tendency to pitch his arguments from a conceptual highground that is notably short on details, thus antagonising ‘specialists’ but also (more importantly, and as I suspect) frustrating the well-intentioned layman. 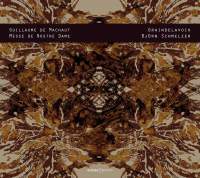 Graindelavoix would be unthinkable without the pioneering work of Marcel Pérès (as Schmelzer concedes); but whereas Ensemble Organum’s recording of this Mass was something of an ugly duckling, I’ve seldom heard a recording of polyphony that synthesises these elements so persuasively. It’s the sort of performance that ought to get anyone excited about early music. The rest of the disc (including the two motets thrown in for good measure) is equally arresting. For now at least, this sceptic’s been won over.